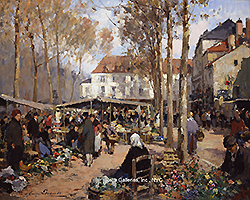 Paul E. Lecomte was born in Paris on October 29, 1877 and received his early training from his father Paul Lecomte (1842-1920), the landscape artist. Showing a great deal of talent, he continued his artistic education at l’Ecole des Beaux-Arts in the atelier of Fernand Cormon (1854-1924), the history and portrait artist. As was typical of many artists at the turn of the century Lecomte combined the more formal training he received at l’Ecole with the new ideas of the Impressionists. While his works display an ordered composition, they are created with thick applications of paint and fluid brushstrokes. Among his favorite subjects were the country market places and their harbors. It appears that Lecomte made his debut at the Paris Salon in 1902 with his work La Gréve du Mont Saint-Michel vue d’Avranches and he would continue to exhibit there throughout his lifetime. Among the other works he exhibited are: Coin du port à La Rochelle (1912); L’entrée du port à La Rochelle (1913); La grand’route (1923); Venise, Traghetto della Dogana (1925); Thonniers au port (1927); and Le Marché du Mercredi à Melun (1933). His work was highly regarded by both the public and his fellow artists, and he was awarded the silver medal for his works that were exhibited that the Salon in 1920 and the gold medal in 1922.